Add a touch of elegance to your Christmas tree with these pretty ornaments made from doilies, pretty ribbons, and tassels. Wrap a doily around your ball as shown in the close-up photo at right. Secure the doily with a piece of ribbon. posite side, gluing the ribbon again under the gathered doily area. Repeat this, spacing your ribbon evenly around the ball. Now on top of the ribbon you just placed, glue a gold strip (1/8 inch) of ribbon through the centre of the ribbon strands you have already attached. 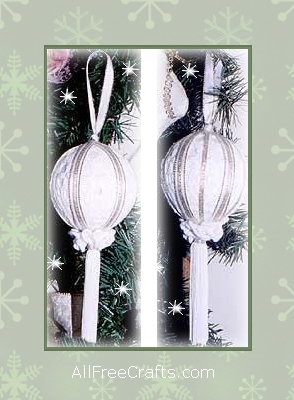 To create the first ornament shown, simply add additional strips of gold ribbon in the same manner as before, filling in the area between the other ribbons. Using the 1/4 inch ribbon, create a loop and glue to the top centre of the ornamnent, glue a tassel inside the gathered area of the doily and you are all done!